"King Fahd Dhahran Air Terminal" redirects here. For the current civilian airport in Dammam, see King Fahd International Airport. King Abdulaziz Air Base (IATA: DHA, ICAO: OEDR), formerly Dhahran International Airport and Dhahran Airfield is a Royal Saudi Air Force Air Base located in Dhahran in the Eastern Province of Saudi Arabia. It was the first airport ever built on Saudi Arabian soil and was operated by the United States Air Force (USAF) from 1945 until 1962. After use by the USAF, Dhahran Airfield became Dhahran International Airport, as well as the co-located King Abdulaziz Air Base of the Royal Saudi Air Force (RSAF). The military relationship that exists today between the United States and Saudi Arabia was highly influenced by the origin and development of this airfield. The base is close to other major cities in the area including Al-Thuqbah (5 km to the east), Khobar (5 km to the southeast), and Dammam (25 km to the northwest). During World War II, the Persian Gulf and Arabian Peninsula were important staging and shipping routes for the U.S. to provide both lend-lease assistance to the Soviet Union, as well as supply the allied forces fighting the Imperial Japanese forces in Asia. Owing to Saudi Arabia’s importance, primarily its location, in 1943 the US extended lend-lease status to Saudi Arabia, one of only three Arab countries to receive this aid. 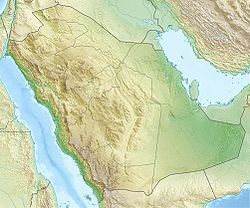 In 1944, the U.S. War Department (renamed in 1949 the United States Department of Defense) proposed building an airbase in or near Dhahran, Saudi Arabia. In 1945, the U.S. and Saudi Arabia agreed signed the Dhahran Air Field Agreement. This agreement permitted the U.S. to build a small air field near the Arabian American Oil Company (ARAMCO) town. The use of the term “air field”, as opposed to “air base” was a direct result of U.S. sensitivity of Saudi Arabia’s concerns regarding imperialism. Further, full ownership of the airfield was scheduled to revert to Saudi Arabia at the conclusion of the war, after an agreed-upon three-year period during which the U.S. would have the rights to operate the field. Despite the end of World War II in the European theater, in 1945, President Harry S. Truman signed the Agreement, which owing to the lack of any military justification, and again a reflection of Saudi Arabia’s concerns regarding imperialism and the symbolism of foreign bases on their soil, was promptly rejected by the King. The War Department, likewise, dropped their support of the project. However, the U.S. State Department, recognizing the economic benefits of this location, and the diplomatic benefits afforded by the agreement, continued to pursue development of the Dhahran Air Field. After Congress approved substantial economic development assistance, the U.S. State Department and the Saudi Government agreed, in August 1945, to develop the air field. The War Department was forced to foot the cost of the construction. In 1948, when the originally agreed-upon three-year post-war period of U.S. operations came to a close, the agreement was renegotiated. While the airfield had not been completed until 1946, too late to be of any benefit for World War II logistics (its original justification) it did provide benefits in the late 1940s, specifically in the context of the increasing tension between the U.S. and the Soviet Union. In 1949 Dhahran airfield was the only airfield in the area which could support the United States Air Force’s B-29s. Thus, the airfield took on increasing importance in the U.S.’s eyes as one location in the U.S. strategy of the containment of communism. For Saudi Arabia, the base provided an element of security from the U.S. forces posted there, among Saudi Arabia’s growing concerns regarding their neighbors, particularly Yemen, and the Hashemites of Iraq and Transjordan. The 1948 agreement reverted ownership of the air base to Saudi Arabia, and on-going year-to-year leases, for which the U.S. would pay rent. As part of the U.S. concession for this on-going access to the air base, the U.S. agreed to send a military team to Saudi Arabia to consult on the Saudi defenses. Through the 1950s, the Dhahran airfield began to emerge as a commercial transportation hub, as the nearby Dammam oil fields increased the overall economic viability of the area. Additionally, Trans World Airlines began using Dhahran as a hub for increasing transport to and from Asia and Europe. The Dhahran airfield and the emerging support facilities became the Dhahran International Airport in 1961, shortly before the United States relinquished control in 1962. The airport terminal building is one of the architectural works of Minoru Yamasaki and was completed in 1961. The architecture is a blending of traditional Islamic forms with modern technology. For example, the flight control tower has the appearance of a minaret. Images of the terminal have been used on Saudi banknotes and is viewed as having influenced the design of a number of important buildings throughout the Middle East. Dhahran served a significant role in the 1994 evacuation of U.S. citizens and personnel from Yemen when that country slid into civil war. During Operation Desert Focus in 1996, after the bombing of the Khobar Towers, the airport was used to relocate over 6,000 U.S. citizens and personnel within the Kingdom of Saudi Arabia. The Dhahran airfield continued to serve as the Eastern Provinces commercial air hub until the completion, in 1999, of the King Fahd International Airport near Dammam, when all scheduled flights were shifted out of Dhahran International Airport. King Abdul-Aziz Air Base has been a major RSAF airbase since the USAF left in 1962, providing air defence, tactical and strategic support for the Eastern Province and nearby regions, as well as providing aviation related technical training to RSAF personnel. Between 1963 and 1999 the base was called Dhahran Air Base. Between 17 September 1963 and 20 November 1963 the United States Air Force's 524th Tactical Fighter Squadron was deployed here with North American F-100 Super Sabres. During Operation Desert Shield/Desert Storm in 1991, the U.S. 101st Airborne Division had their base setup at the airport. A detachment of Royal Air Force Panavia Tornado GR1's from No. 31 Squadron RAF were based here during January 1991. During October 1994 the USAF 75th Fighter Squadron (A-10 Thunderbolt II aircraft) was moved to Dhahran Air Base, prior to forward deployment to Ahmad al-Jaber Air Base, Kuwait. In 1999, Dhahran Air Base was renamed King Abdulaziz Air Base. Dhahran International Airport has been transformed into a military airbase. It has been renamed King Abdulaziz Air Base and serves the purposes of the Royal Saudi Air Force. There are also a couple of VIP airlines that operate out of DHA. Aviation link company operates one A319 and B777-200. There is also nexus flight operations that operates one A319. ^ "Middle East Countries: Syria, Iran, Iraq, Afghanistan, Jordan, Saudi-Arabia". World Digital Library. 1955. Retrieved 2013-07-27. ^ "19 Years Over Iraq". The Official RAF Annual Review 2010. Stamford: Key Publishing: 12. December 2010. ^ a b "Royal Saudi Air Force - Dhahran (King Abdullah Aziz Air Base) (OEDR)". Scramble.nl. Retrieved 8 July 2014. Airport information for OEDR at World Aero Data. Data current as of October 2006. This page was last edited on 8 March 2019, at 07:07 (UTC).